Jólan van der Wiel Takes Us On A Raindrop's Journey — WorksOnWater Works On Water Blog Blog focused on artists who examine, move over, look at, work with, journey on, use metaphorically, or create new connections to water, rivers, lakes, oceans, or boats. An article in L’Officiel Art by Abraham Martinez and Yasmine Maggio. Though most of us may dread a forecast of rain, Jólan van der Wiel begs to bring it on. In the Dutch designer’s latest project, titled “Journey of a Raindrop: The strange attraction of water” and on display at ISSEY MIYAKE in Milan, we get a unique perspective of water and air by bringing nature’s forces inside. With a variety of installations made of transparent tubes, van der Wiel walks us through the many forms that a raindrop takes: a spiral shows rain’s interaction with wind, crystal-like shapes bring to mind its frozen state and water streaming upwards is reminiscent of evaporation. The installations beautifully interacts with other elements of the store in order to create a one-of-a-kind visual dialogue surrounding the idea of nature’s powerful forces. Tell us about the materials you used. The idea was these drops of water traveling through the building. I wanted to develop these transparent tubes where there's different pressure. We can play a bit with gravity, so the water can go up, it can go horizontal, it can go any direction. 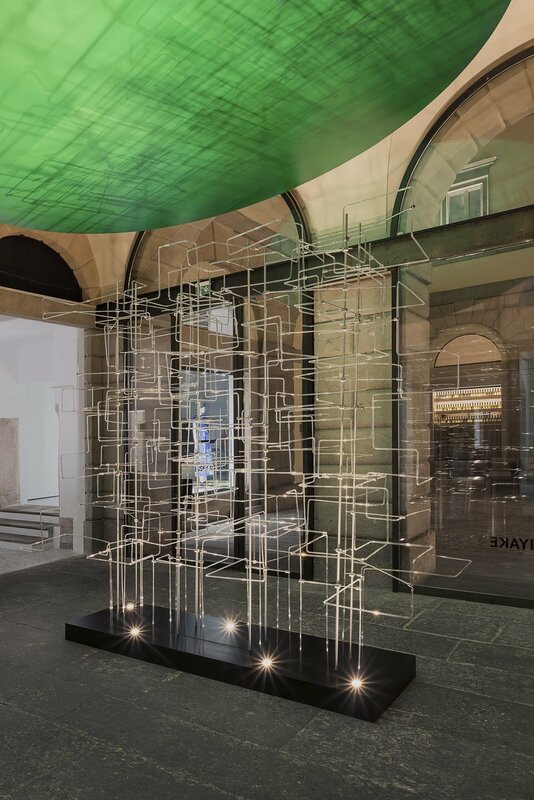 We developed this structure of installations from transparent tubes which are shaped into different structures inspired from different natural forces—basically the whole Earth in small installations. What you see is water and air going through those tubes. Read more at L’Officiel Art.